I like vintage barber shops. There is a comfortable feeling I get whenever I walk into these corners of men’s tonsorial establishments. The smell of hair tonics, Pinaud Clubman Aftershave, West Indies Bay Rum Hair and Scalp, and Barbicide all combine to give a nostalgic at-home feeling. After the untimely death of my barber of sixteen years, the late, much-lamented Dave Machavi, his family rented out the space to a hair stylist with a ring on his nose and hair that tilted a bit sideways, and the day I appeared at the door, the place was completely transformed. Gone were the vintage chairs, posters and smells that made Dave’s shop such a delight to go have my ears lowered. Instead, the place had been completely transformed into an avante-garde beauty parlor, with a lady being worked on by this young man with a unique sense of style. He told me I needed an appointment, or to return in half-an-hour. Well, that left me wandering to look for an alternative tonsorial joint. In my wanderings, I noticed a small hole in the wall I have passed by many times, but never quite noticed before. It was called “Nelson’s Barber Shop,” and it seemed to have all the appointments of a traditional hair-shearing place, so I parked my car, and walked in. The first thing that hit my olfactory senses was the smell of West Indies Bay Rum all-purpose after-shave, hair-and-scalp, after-bath lotion. If any smell shouts out “masculinity,” it would be that lotion, and there was a good redolence of it filling the air. The barbers were all Mexicans, so Spanish was the dominant language of the day, which suited me fine, given my Cuban heritage. 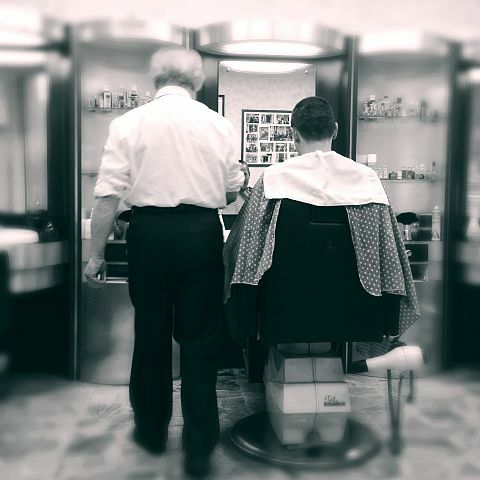 Agustin sat me down on the old-fashioned barber seat and we started on a bit of small-talk, mostly introductions, and after asking me how I wanted my ears lowered, there was a bit of silence thereafter, maybe for five minutes. Then he asked me what I did for a living. It’s quite difficult to describe my job in the Torrey Honors Institute, so I simply told him that I was a medieval historian teaching history, philosophy and literature. I seemed to have caught his attention when he heard me say I taught literature, because he then asked me if I have ever read and taught poetry. This is not a question you hear barbers ask every day, so now he had my attention. I said that yes, there was some poetry that formed part of the curriculum, especially those of the major English poets. “Like Shakepeare’s sonnets?” he asked. “Yes, but we do mostly his plays,” I replied, gratifyingly surprised at his answer. This was one barber you don’t run into very often. He explained that when growing up in Sinaloa, his family did not have much by way of material wealth, but it was a home filled with music and poetry. He loved to go to the local library and read as many books he could get his hands on: Homer, Cervantes, and a few Latin American poets. He especially loved poetry. He said the lyrical tone of his favorite poets, such as Pablo Neruda and Jose Luis Borges, moved him. He had memorized a few. Here is a sample of the poetry he recited to me as he was cutting my hair. For the benefit of our readership, I will give present them here in English translation. Fashioned of darknesses and pain. I was timid and childlike shy. Than I ever had hoped to find. Wilted in me forever now! To gnaw my very heart she strove. Or heart-born fantasies of her. But life is hard. Bitter with pain. There is no princess now to sing! Ah, but the golden Dawn is mine! This is just a sampling of some of the poetry I heard that day as I was having my hair cut, but I knew that I had come into a cultural experience I had not bargained for, an enrichment of mind and heart that I was not expecting, a pleasant surprise that came as gift, as blessing. So I left Nelson’s Barber Shop with a little more pep in my step, having gone in for a haircut, but coming out with a mind and heart-affirming experience.